We’re looking forward to another exciting collaboration with the Chilliwack Symphony Orchestra and Chorus at the Chilliwack Cultural Centre on November 12. FVAD will be performing excerpts of the Nutcracker as part of the Cirque performance. 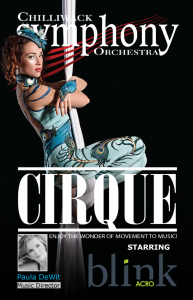 From the CSO website…Cirque:If you like pizzaz, action and class then this is the concert for you! Back again by popular demand and request! Chilliwack will present our Cirque staring Blink Acro. We will be in collaboration with many performers from the Fraser Valley to present this spectacular concert. Last year this concert sold out a week before the performance date so be sure to get your tickets early for the best seats in the house..